After 5 rounds played we can already see who rules in the National League and who belongs to weaker ones. Here is the last round review presented by ESL. The most crucial game of the last round was the first loss of undefeated Almat.Legion (3-1) in Alma-Ata on Wednesday night. Hosts were defeated by second ranked Tobol (5-3) 73-66. 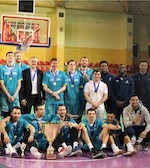 Tobol have a solid series of three victories in a row. They maintain second place with 5-3 record having just three points less than leader Astana. Newly promoted Almat.Legion dropped to the fourth position with one game lost. Tobol are looking forward to face Barsy Atyrau (#3) on the road in the next round, which may be the game of the day. Almat.Legion will play against Kaspiy Aktau and is hoping to prove to their supporters that the loss was just an accident. Important game to mention about took place in Alma-Ata. Fifth ranked Almat.Legion (3-1) saved a 3-point victory at home edging second-ranked Tobol (5-3) 82-79 on Thursday evening. 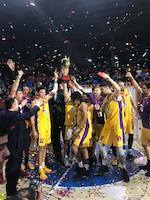 It ended at the same time the three-game winning streak of Tobol. Almat.Legion moved-up to fourth place. Tobol at the other side keeps the second position with three games lost. Almat.Legion will play against bottom-ranked Kaspiy Aktau (#7) on the road in the next round. Tobol will play against Barsy Atyrau (#3) and it may be a tough game between close rivals. Another exciting game was a derby match between two local teams from Atyrau: Barsy Atyrau (#3) and Barsy 2 (#4). Barsy 2 was crushed at home by 38 points 72-110 and even the advantage of their own court did not help. Barsy Atyrau have a solid series of three victories in a row. They maintain third place with 4-2 record having six points less than leader Astana. Newly promoted Barsy 2 dropped to the fifth position with seven games lost. Barsy Atyrau will meet at home league's second-placed Tobol in the next round and it will be for sure the game of the week. Barsy 2 will have a break next round. Another exciting game was again a derby between two teams from Atyrau: Barsy Atyrau (#3) and Barsy 2 (#4). Barsy 2 was crushed at home by 27 points 73-100 and even the fact of playing on their own court did not help. Barsy Atyrau have a solid series of three victories in a row. They maintain third place with 4-2 record having six points less than leader Astana. Newly promoted Barsy 2 dropped to the fifth position with seven games lost. Barsy Atyrau's next round opponent will be league's second-placed Tobol in Kostanay and it will be for sure the game of the week.